A big, wonderful “thank you” to Marshall Heyman of The Wall Street Journal for featuring the launch of The Chosen Few in his column today. 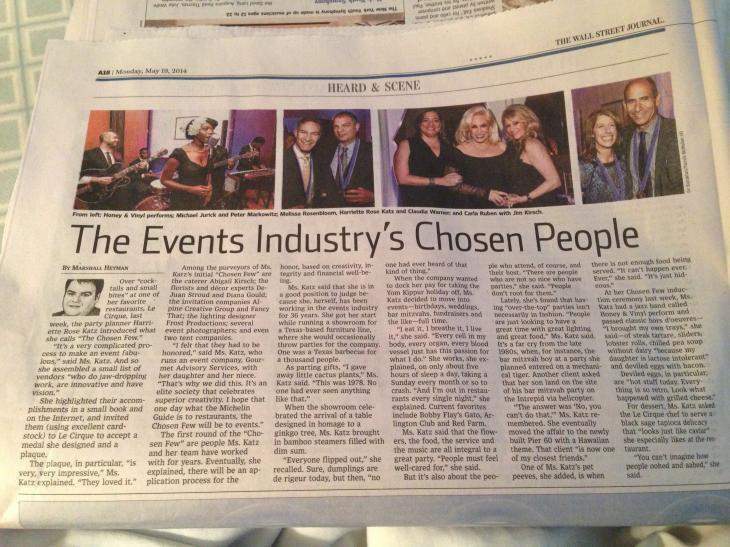 As I said to Marshall in the interview for the article, “The Chosen Few is an elite society that celebrates superior creativity” in the events industry and was something I had to do! These wonderful artists and professionals, whom I have had the pleasure to work with for years, had to be honored. I really do “hope that one day what the Michelin Guide is to restaurants, The Chosen Few will be to events.” Read more of the article by clicking on the image or The Wall Street Journal, Article on The Chosen Few and Harriette Rose KatzThe Wall Street Journal, Article on The Chosen Few and Harriette Rose KatzThe Wall Street Journal, Article on The Chosen Few and Harriette Rose KatzThe Wall Street Journal, Article on The Chosen Few and Harriette Rose KatzThe Wall Street Journal, Article on The Chosen Few and Harriette Rose Katz. Among the purveyors of Ms. Katz’s initial “Chosen Few” are the caterer Abigail Kirsch; the florists and décor experts DeJuan Stroud and Diana Gould; the invitation companies Alpine Creative Group and Fancy That; the lighting designer Frost Productions; several event photographers; and even two tent companies. The first round of the “Chosen Few” are people Ms. Katz and her team have worked with for years. Eventually, she explained, there will be an application process for the honor, based on creativity, integrity and financial well-being. Ms. Katz said that she is in a good position to judge because she, herself, has been working in the events industry for 36 years. She got her start while running a showroom for a Texas-based furniture line, where she would occasionally throw parties for the company. One was a Texas barbecue for a thousand people. When the showroom celebrated the arrival of a table designed in homage to a ginkgo tree, Ms. Katz brought in bamboo steamers filled with dim sum. When the company wanted to dock her pay for taking the Yom Kippur holiday off, Ms. Katz decided to move into events—birthdays, weddings, bar mitzvahs, fundraisers and the like—full time. “I eat it, I breathe it, I live it,” she said. “Every cell in my body, every organ, every blood vessel just has this passion for what I do.” She works, she explained, on only about five hours of sleep a day, taking a Sunday every month or so to crash. “And I’m out in restaurants every single night,” she explained. Current favorites include Bobby Flay’s Gato, Arlington Club and Red Farm. Ms. Katz said that the flowers, the food, the service and the music are all integral to a great party. “People must feel well-cared for,” she said. Lately, she’s found that having “over-the-top” parties isn’t necessarily in fashion. “People are just looking to have a great time with great lighting and great food,” Ms. Katz said. It’s a far cry from the late 1980s, when, for instance, the bar mitzvah boy at a party she planned entered on a mechanical tiger. Another client asked that her son land on the site of his bar mitzvah party on the Intrepid via helicopter. At her Chosen Few induction ceremony last week, Ms. Katz had a jazz band called Honey & Vinyl perform and passed classic hors d’oeuvres—”I brought my own trays,” she said—of steak tartare, sliders, lobster rolls, chilled pea soup without dairy “because my daughter is lactose intolerant” and deviled eggs with bacon. For dessert, Ms. Katz asked the Le Cirque chef to serve a black sage tapioca delicacy that “looks just like caviar” she especially likes at the restaurant. “You can’t imagine how people oohed and aahed,” she said.